The trend has been pretty easy: Pompano remain a best choice with the weather so hot going on two complete months. Deeper water means more cooperative fish. The pompano have increased in numbers and size as the summer has moved on. 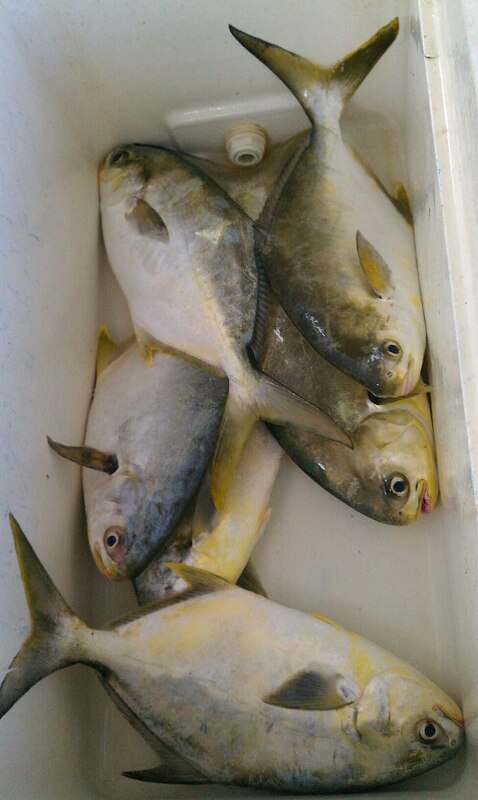 Routinely, our pompano have been 15 inches. Catches of 30 or more per day are regular. We have had a 60-fish day. Catching pompano is about location and technique. Location: Depths of 9 feet or more with sand bottom, current is a bonus. The choices for the Tampa Bay area are the passes, the bridges and the deep troughs. Later in the summer now bridge fishing should be becoming best. Technique: Jigging is the only way to go. Get pompano jigs and teasers. Loop knot your jig to your teaser. Cast your jig/teaser out and then make sure it is bumping bottom 100 percent of the time. If your lure is not on the bottom you will not catch pompano. There is jigging and there is jiggling. Jigging is popping the lure pretty strong. Jiggling is just wiggling the lure, something that works when the fish are not as aggressive. Learn both techniques and do it the way the fish want it. The limit on pompano is six fish, minimum size 11 inches. I will not keep a pompano under 13 inches.